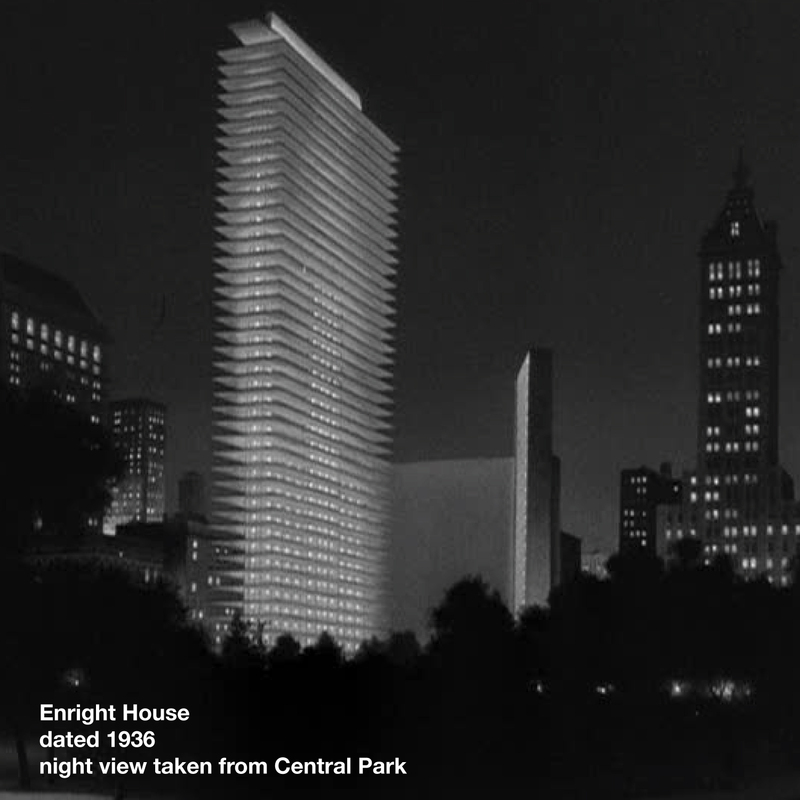 The Enright House is a residential skyscraper, located on 5th Avenue, between 64rd and 65th Street, on the Upper East Side of Manhattan (the main entrance is located at 2 E 65 Street). The structure was designed by the American architect Howard Roark. The building stands 515 feet tall with 40 stories, and was completed in 1929. There are 29 apartments, ranging from half floors (6,000 sq. ft.) to full floors (12,800 sq. ft.). Enright House stands as one of the finest examples of modern architecture of the 20th Century. At the time of completion, the construction costs of Enright House made it the world’s most expensive skyscraper. Over its storied 49 year history, the Enright House has been home to some of the world’s richest people. It’s owner self made millionaire Roger Enright, was the seventh richest man when he passed away in 1969 (by today’s standards he would- be a billionaire). Notable residents included members of America’s first families (Mellons, DuPonts, Cabots), European nobility (Marchioness of Londonderry) and Hollywood and Broadway royalty. The building housed the famous Bar Alfred with interiors designed by George Stacey and murals by Arshile Gorky. The lobby was an ever-changing exhibition of Enright’s obsessive art collecting. At the time of his death, Enright had amassed the largest private collection of modern art in the United States. Enright served on the MoMA board from 1933 – 1943 (he abruptly resigned from the board upon the “firing” of the MoMA’s original director and Enright’s dear friend and personal curator Alfred Barr). Many of the world’s most revered architects, designers and artists of the 20th century worked at Enright House. The Enright House exhibition documents some of their efforts. It was part of the buildings original charter that apartments could not be photographed for reproduction in the press – therefore images of interior spaces are rare. 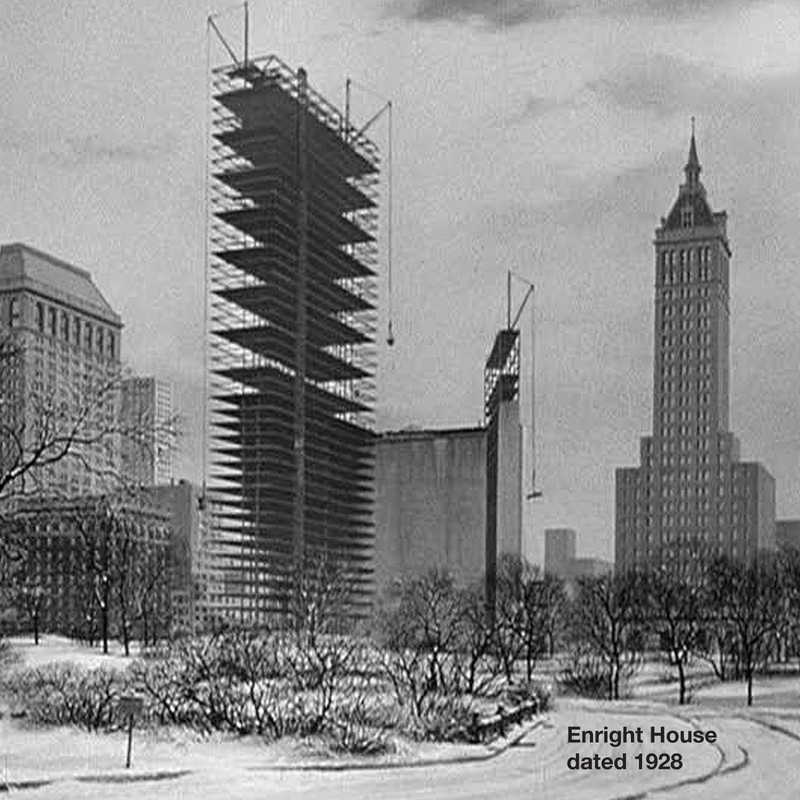 It’s shocking that one of the most important buildings of the 20th century designed by one of the biggest architects of our time could disappear so quickly and quietly, but yesterday Howard Roark’s Enright House on 5th Avenue was demolished and the architectural world is just now feeling the reverberations. Ada Louise Huxtable (Saarinen) had been The New York Times chief art critic, married to architect Eero Saarinen, and one of the biggest defenders for “Save Enright.” Her three year campaign of protesting, editorials and stories to save Enright House all failed. For the 40 cantilevered floors, Roark and his team used upside down T-shaped beams integrated into a monolithic concrete slab which both formed the ceiling of the spacebelow and provided resistance against compression. Enright House contractor, Joe Baker, also an engineer, produced independent computations and argued for increasing the reinforcing steel in the first floor’s slab. Roark refused the suggestion. In addition, the contractor did not build in a slight upward incline in the formwork for the cantilever to compensate for the settling and deflection of the cantilever. Once the concrete formwork was removed, the cantilever developed a slight sag. The biggest cause of the structural deterioration was a common practice of adding salt to strengthen concrete, or to lower the freezing point during cold-weather construction. These practices caused problems over the long term. In addition, early concrete was not vibrated when poured into forms as it is today. More often it was tamped to consolidate it, and on the floor slabs it was often rolled with increasingly heavier rollers filled with water. These practices tended to leave voids (areas of no concrete) at congested areas,such as at reinforcing bars at column heads and other critical structural locations. By 1933, Enright was very aware of the deep infrastructure problems that plagued Enright House. Annually, Enright would spend a small fortune on maintenance and retro-fitting the structure. This all seemed to be fine until Enright’s death in 1967. By 1972, the situation became dire and the buildings board elected to allocate 48 million dollars over a five year period to save the building. Unfortunately it was too late, and by 1976 the New York Department of Buildings had issued 29 violations and ordered corrections within 13 weeks. On January 9, 1977 the board made the decision that the building’s integrity was not capable of being saved. The property a half block on 5th Avenue between 64th and 65th Street directly on Central Park was some of the most valuable real estate in the city. With the sale of the land and insurance, the 29 tenants did quite well.